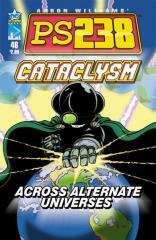 #46 "Cataclysm - Across Alternate Universes"
Victor Von Fogg has obtained the technology behind the Ultimate Negatory, a device with the power to erase worlds. He has adapted the plans to create the ultimate power source, one that harvests the energy of an entire parallel universe! But Zodon has caught wind of his plans, and, oddly, wants to enlist the aid of ps238's hero-children to stop Victor's plans. And it turns out that the metahuman kids of Earth aren't the only ones who want to have a word with the young Victor about blowing up universes. See the beginning of this epic saga in ps238 #46!